“You are not autistic, you are a “person with autism”. “You are so much more than your diagnosis”. “Put yourself before the disability”. “I see you, not the disability”. I have already written – a lot – about the absurdity and ineffective claims of Person First Language (PFL) proponents. This post is a challenge to people who insist that “seeing the person, not the disability” is the respectful way of treating Autistic people – and all disabled people. (It is not. The respectful way is the way each individual chooses for themself). First, the reason why I am writing about this again. I have been reading my old reports, assessments and IEPs. Some of them are over 25 years old, others are from my late teens. All of them identify me as *Autistic*. In an old video recording of a local news piece with me as the subject, I am identified as an “eight year-old autistic girl”. The news people use Identity First Language naturally, which is the only way of using Identity First Language. 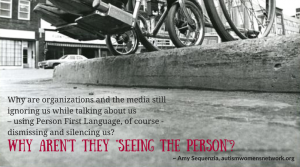 Today, government agencies, the media, most organizations and many parents have guidelines – very inflexible guidelines – that demand the use of Person First Language – supposedly because PFL makes us more human in the eyes of the rest of the world. So, I am reading the reports and watching the videos and I remember when I was young and in school. I was often treated badly, ignored, neglected, silenced and abused. I was not considered a real person. I was not deserving of rights. But, if Person First Language is so great and makes people “see” us, why are the same agencies, the media, the school districts that often ignored me, the teachers that abused me, the “experts” that saw me only as a burden on my parents, telling them that the best “solution” was to send me to an institution still treating today’s Autistics so badly? Why are organizations and the media still ignoring us while talking about us – using PFL, of course – dismissing and silencing us? Why aren’t they “seeing the person”? Prove to me that PFL makes “the world see” us. Because I am still silenced by the media and organizations that say I “have autism”. Because disabled protesters are literally bleeding, being bruised and arrested by a police force called by senators who want the “people with disabilities” removed. Because the Judge Rotenberg Center still shocks and tortures “students with disabilities” and “students with autism”. I am certain that their guidelines demands that employees use PFL. The reality is that PFL is not about us. It is about the neurotypical and non-disabled imposing a way to address us – something we didn’t ask for and that they never consulted us about – so that they can feel good about “protecting” and “guiding” us. PFL exists because neurotypical and non-disabled people actively ignore the Autistic community and the disabled community. To them, we don’t have agency or an independent voice. To them, imposing their preference, while ignoring ours, is all they do. They are not worried about how we are treated, as long as we are “People Firsted”. Then, all is good in their world. (Exception: the Intellectual Disability community, which prefers PFL). I don’t have a problem with neuro-typicals using their “person-first” language, but I do have a problem when they correct Autistic people in their choices of what they call themselves. They don’t do this with other marginalized and minority groups as often as they do with disabled people. Perhaps it is because they cannot get away with it as much, or that disabled people have enough battles to fight without picking that battle. It’s just an adjective. People never say you have to carefully, tactfully call Michael Jordan a person with tallness.